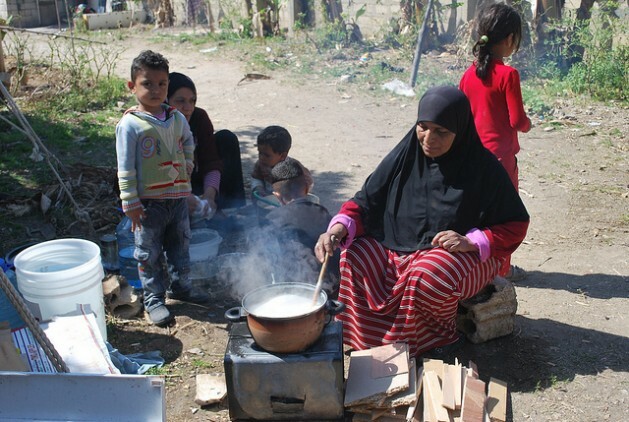 A Palestinian family from Yarmouk camp in Syria now living on the fringes of Ein el Helwe camp in the south of Lebanon. Credit: Mutawalli Abou Nasser/IPS. UNITED NATIONS, Jun 16 2016 (IPS) - When conflicts or natural disasters occur, migrants are often the “the first hurt and last saved”, Colin Rajah of the Global Coalition on Migration (GCM) said here Wednesday. Rajah was speaking at the launch of a new set of guidelines which have been developed to address the problems migrants face when crises hit their host countries. The Guidelines to Protect Migrants in Countries Experiencing Conflict or Natural Disaster, which were developed by the governments of the United States and the Philippines, together with the International Organization for Migration (IOM), were officially launched here Wednesday. The guidelines received strong support from the UN Special Representative of the Secretary-General (SRSG) for International Migration, Peter Sutherland. Crises disproportionately affect migrants, as was the case in Libya in 2011, when the uprising against dictator Muammar al-Gaddafi resulted in armed conflict all over the African state. According to IOM-reports, almost 800,000 migrants from 120 nations crossed Libya’s borders in the first year after the revolution. Evacuation was tough to coordinate. The pictures of these events served as the “real catalyst” for the work of the MICIC, Sutherland said. The MICIC has now put together a framework, which at first glance seems relatively simple. Ten principles and 15 guidelines serve as a reminder of the fact that migrants and permanent inhabitants should be treated equally in cases of crises. As Sutherland puts it: “The guidelines are deeply grounded in common sense.” The broad approach was approved by the audience of Wednesday’s launch. “My sense from today is that these (guidelines) are very welcomed,” Anne Richards, US Assistant Secretary of State for Population, Refugees, and Migration, told IPS. Nicolas’ concerns about implementation were also addressed by others during the launch event. Now that a first version of the guidelines is published, implementation is the next step. As the multi-stakeholder approach of past MICIC consultations has an impact on the implementation phase, too, various paths will be taken. Civil society has long been known to promote a better integration of migrants into the existing structures. In his speech, Joseph Donnelly of Caritas International reminded the audience that nongovernmental organizations have followed the new guidelines before they even existed. Yet, he strongly supports the draft because it is “useful” to raise awareness. On the state side, policy development is expected. Aside from the four states and the European Commission that participated in the working group, other state representatives have shown their approval of the guidelines. Anne Richard is relieved: “We weren’t sure how welcomed they would be by member states beyond the working group and I think you heard today that there is broader interest. That is fantastic”, she told IPS after the launch. With positive reactions from states and optimistic civil society remarks, there is one more group that plays a key role in the migrant protection concept: The private sector. Back in 2011, while the international community struggled with public action in the Libyan uprising, the Marriott International hotel group was facing the challenge of evacuating their newly opened hotel in Tripoli. Jack Suwanlert, in charge of Marriott’s crisis management, later joined the guideline development due to his experience gained in Libya. The local hotel team had chartered a plane on their own initiative and arranged transit visas for all guests and the 185 migrant employees. The undertaking served as an example of migrant protection in business, where simple steps taken by employers can ensure migrants’ safety in critical situations. Cases like the Tripoli hotel evacuation show the need for a bottom-up approach in the implementation of the migrant protection guidelines. At the same time, all of Wednesday’s speakers set their sights on the UN General Assembly high-level meeting on migration and refugees on September 19.